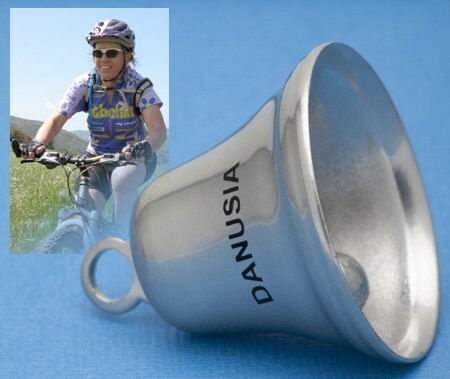 The Danusia Bell is Now On Sale to help celebrate the legacy of Danusia Bennet-Taber and alert other trail users to your approach. It is available at our online store. All proceeds go to the Sarcoma Alliance. Order your bells today! Girlz Gone Riding Rocktober 20th XC Gala 2013 Wrap Up and Photos! Fun This Friday Night October 25th! What CORBA Does Recently a bicycle club-team representative contacted CORBA wanting to see what more they could do to get more of the trails that are currently closed to bicycles opened up to shared use. A couple of comments from the correspondence were that they thought that showing up in larger numbers to public meetings would help, and that they thought the main reason that trails were closed were because of an influential public anti-bicycle lobby. Private Property Should Be Respected Due to vandalism, trespassing, and disrespectful behavior by some inconsiderate mountain bikers, the private horse trail that connects Sullivan Canyon at Queensferry Rd. and the residences below at Old Ranch Road (Brentwood) will have gates and cameras installed. We have known about this situation for quite a while. And even though this trail was created more than 70 years ago for horses only, hikers and bikers have also been using it. But because of continued vandalism to signs and disrespectful, even aggressive behavior by some mountain bikers toward local residents, the decision was to install large gates and surveillance cameras. The CORBA Kids Club had the opportunity to view and ride among budding native plants post fires this past September. It was unseasonably hot, so Sycamore was the coolest place to ride that day, and the temperatures continued to increase as we headed North from Pt. Magu State Park along the Two Foxes trail. We have a photo gallery of the ride for September! 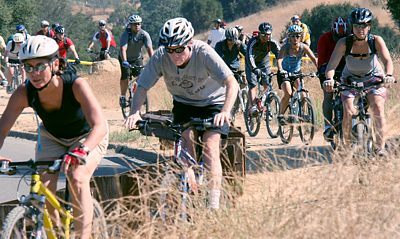 The IMBA Annual Take Your Kid Mountain Biking was cancelled last month due to expected high winds and fire danger. 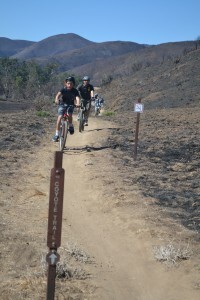 The next ride is Saturday, November 2 at Malibu Creek State Park. Hope to see you there! Sometimes a picture is worth a thousand words. We have created this message tag with the help of BikeTags (biketag.wordpress.com) so that we can spread the message of goodwill, peace, and harmony throughout the world. Or maybe just the message “don’t worry, be happy.” The idea is to show other trail users that we belong, we care, and we can coexist. Similar to the SoCal High School Cycling League’s “spirit of howdy”, it’s a way to remember to slow down and smell the sage brush. 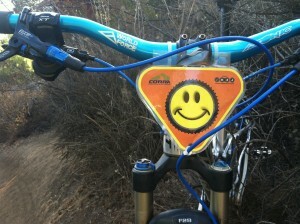 We’ll be making the CORBA Smile Tags available to anyone who wants one, just send an email request to info@corbamtb.com. We’ll be giving away prizes for the best photos of the tags on your bikes while on the trail. Photos will be judged on originality, creativity, and overall quality. (Details to follow in the coming weeks). The grand prize will be a Niner full suspension frameset, donated by Niner. OK, so maybe putting the Smile Tag on your bike won’t save the world. But a lot of times a little smile can go a long way. November 28 (Thansgiving Day): Intermediate Ride: Sycamore - Sin Nombre-2 Foxes-Guadalasca-Backbone. A locked gate has been blocking the Backbone Trail (BBT) at the west end of Etz Meloy Motorway since mid-October. This interupts a very popular ride from the parking area on Encinal Canyon Road to the Mishe Mokwa Trailhead, covering the two newest singletrack sections of the Backbone Trail. There has been a standard fireroad gate there for years, but apparently some months ago a side gate appeared that completely blocks passage along the road. This side gate was usually open or unlocked, but was permanently locked at about the time of the federal governement shutdown in October. This led to speculation that it was the National Park Service (NPS), owner of most of the land around this section of the BBT, who closed off the trail to keep people off of federal property during the government shutdown. However, the locked gate was a surprise to the NPS as much as to the rest of us. Apparently one of the private landowners in the area has locked the gate. One rumor is that it is to keep noisy and littering partiers out. Some of the land crossed by Etz Meloy Mtwy at the west end is still in private hands. The NPS is actively trying to acquire this propery or make some other arrangements with the landowners to allow public access. Until that happens, the west end of Etz Meloy has been and continutes to be closed to public access (see map above). 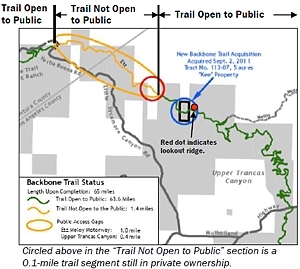 The NPS asks that members of the public stay off of this section to help engender the landowner's cooperation in discussions to allow everyone to use this trail. CORBA will provide more information as it becomes available. Girlz Gone Riding Rocktober 20th XC Gala 2013 Wrap Up and Photos! Another GGR annual event in da books held at Malibu Creek State Park for the 3rd time. Dubbed the GGR Rocktober 20th XC Gala. This year’s event was dedicated to Danusia Taber, who lost her battle to cancer this past May. The morning opened up as usual with the girlz signing in and picking up their goodie bags and bike plates. Then many of them headed over to the Hammer and CORBA fuel station for some java and morning goodies. The morning address was focused on how far we have come in the last 3 years. The enormous amount of women mountain bikers in Los Angeles and sticking with it speaks for itself! GGR has grown to almost 450 members, most of these ladies in the LA, OC, Ventura and San Diego area. Many of them made the drive to attend this event. Between GGR, Trail Angels and SOCAL Endurance ladies, we have over 1000 women riders! 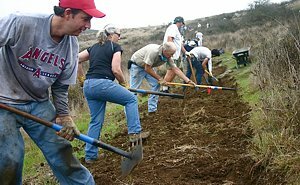 SOCAL is beaming with women who love their dirt! Saturday November 2nd is the next skills clinic.